Frigidaire FAFS4272LA Affinity Classic Silver Front Load Washer 3.81 Cu. Ft. 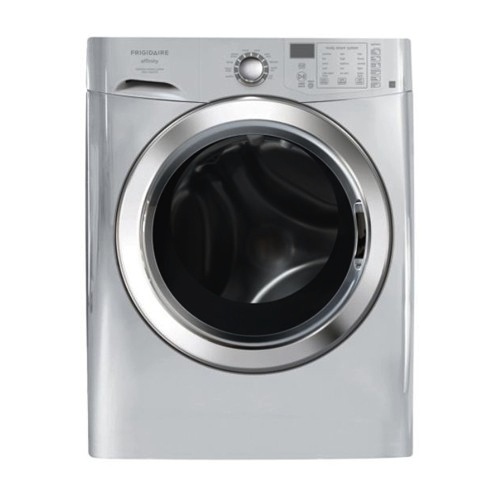 Available in classic exterior styling and equipped with features for a better cleaning efficiency, the Frigidaire FAFS4272LA front load washer is a reliable laundry machine that makes everyday tasks at home much easier. The Ready Steam option makes your clothes come out clean and completely stain free. And with the Silent Design feature of this washer, you are ensured of a quiet operation each and every time. The Ready Steam feature of this washer gives you cleaner clothes as even the toughest stains are removed effectively. You can accomodate bigger loads as well, without having to worry about vibration and noises, as the Vibration Control System keeps the washer stable at all times. The Silent Design also results in a more quiet operation even while using the washer for bigger loads. Those who want to ensure a bacteria free washing will find this washer to be completely reliable. With its NSF certification, your laundry will be free of bacteria and impurities by as much as 99.9%. And while this washer ensures that you get completely clean clothes, its WashSense Technology makes sure that your clothes are handled with extreme care. The TimeWise feature allows you to accomplish your laundry tasks within time, as drying time equals that of the washing time. The Energy Saver Option keeps your energy consumption at a minimum, reducing it by as much as 60%. With the Save Your Settings option moreover, you can accomplish more in any given time, as you can save your previous settings for future uses. With its multiple cycles, you can choose which cycle to go for according to your wash loads. And since this washer can be programmed to start within one hour or up to 14 hours, you can wash according to schedule, all the time. Available in different exterior styling options from Classic Silver to Classic White, as well as Blue, and Red. Drum material is of high quality stainless steel. Excellent construction is evidenced moreover by its Stay Fresh Door Seal and Stay Put Door. The Express Select Controls make it easier for you to set the cycle or option of your choice, with just a touch of the button. Capacity: 3.81 Cu. Ft. cu. ft. Install this washer easily and ensure a vibration free operation each and every time through the Vibration Control System. Get clean and bacteria free clothes after each laundry operation as this washer has earned its NSF certification. This means that your clothes are 99.9% bacteria free. Reduce energy consumption drastically by as much as 60% with its Energy Saver Option. Easily add a garment or two while the cycle is going on through the Add-a-Garment option. This washer does not have Extra Cycle Options, unlike other washers in the market. The number of wash cycles for this washer is below average, compared to other Frigidaire models or other brand names. CEE Tier 3 Qualification is the highest rating in efficiency any washer could obtain. Unfortunately, this washer does not come with a CEE Tier 3 qualification.